You see, I do have quite a “knack” for the little things…the details, the small things, the minute things that, to some, may seem unimportant or even insignificant. Often in my life, I’ve tried to hide this trait from others, or at least, not relish in it, for fear of being the “odd man out.” Sometimes, I’ve even tried to deny or ignore it within myself, because it seemed like a petty flaw. To shed a little light, I grew up with a single mom for many years of my young life, and she has a real “knack” for the more unstructured, artsy way of life; then, I married a man who is incredible at seeing the “big picture,” and who really doesn’t like to get bogged down with the minute details of things. In addition, we have two growing boys who are just that: “boys;” details to them just sound like a lot of work and rules, and “it definitely takes up too much time, Mom!” LOL. Oh, but how I relish in details! For example, one of my favorite things to do is to edit/review papers for grammatical errors. I love to journal in full detail all of the happenings of the day…and sometimes, of a particular hour! I thrive when I can share every fact I know about personality traits or leadership styles. I get excited when I can evaluate, analyze and project about a particular subject I’ve been reading. I also love to sit by a campfire and watch the moving and crackling of the tiniest flame. 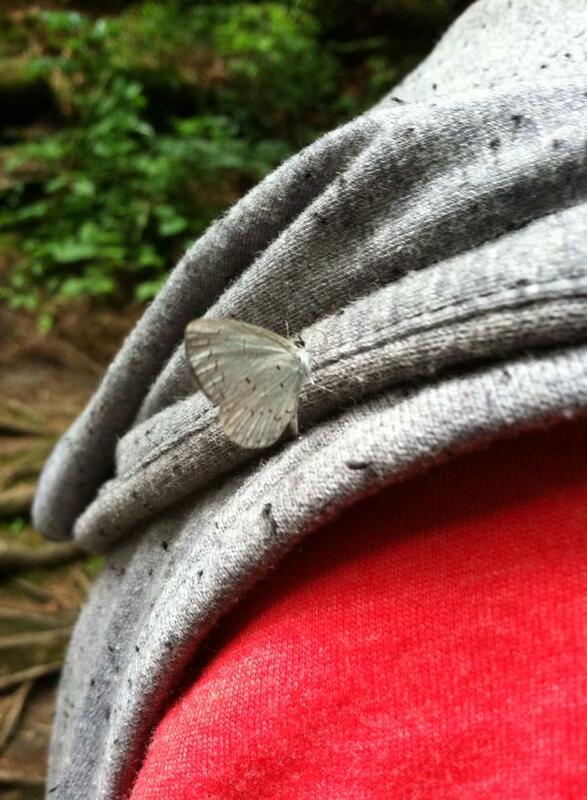 I enjoy watching the flight of the small butterflies around the edge of a beautiful waterfall, even as one decides to land on my son’s shoulder (see pic). I smile as I watch a young mom on a crowded putt-putt course stop to teach the youngest of four rowdy children just how to correctly hold that club. I just love details! However, details take time, and in a society that seems destined for the fast lane, in a culture where things must be achieved this instant, and in a generation for whom waiting for a microwave to finish seems like utter torture, time isn’t something we always have, nor are quite willing, to give. So, my love for details can, often, get in the way. My love for the little things can often be a speed bump in this fast paced life in which we live, and sometimes, I do have to work to move beyond my hang-ups…like while telling a story, and I can’t remember the date and time of the given event! (If you’ve ever heard me tell a story, you know exactly what I mean!) I do have to strive to overlook the not-so-rinsed-off dishes that my sons just loaded into the dishwasher (because after all, they did load it!) I do need to not get so uptight when my husband decides it’s time to make a change which I wasn’t quite expecting. However, I will choose to thrive in the small things which bring life back into focus. I will choose to recognize the small things that bring life back into life. There is life in those tiny hands and feet which remind me of days gone by, those days I won’t ever get back again. There is life in that little smirk my 12 year old gives me as he sees me “trying to dance” while doing the laundry. There is life in the unpredictable moments of my husband’s love for adventure and spontaneity. There is life in that tiny star which shines through the clouded sky as I gaze at it tonight. There is life in that small moment we set aside to make a call or visit to an elderly with failing health. There is life in that small, un-praised minute you take to pick up some trash so someone else just sees the park’s beauty. There’s life in that blooming flower which reminds you to stop a moment and breathe it all in. There’s life in that tiny trickling brook which brings refreshment to a weary soul. There’s even life in that rainbow which you send as a mobile pic to someone just because they were sick and couldn’t get outside to see it. There’s LIFE in the little things of life. Don’t miss them!